El Paso — Mild-mannered, soft-spoken Mexican Catholic Priest Alejandro Solalinde Guerra might quibble over being considered “a living saint” or a “hero,” but even he wouldn’t disagree with thousands of supporters around the globe who call him a rebel because of his fearless grassroots work on behalf of poor defenseless migrants and victimized women in Mexico and Central America. His human rights advocacy has raised eyebrows among the powerful in his country and the hackles of Mexico’s elite politicians from his native state Oaxaca all the way to Los Pinos. In the past, death threats forced him into exile in the U.S. for a while. Even that hasn’t silenced or slowed the 70-year-old Solalinde. Solalinde is founder of Hermanos en el Camino, a migrant shelter in Oaxaca that provides shelter and humanitarian aid to migrants from Central America and other countries traveling through Mexico to reach the U.S. In a recent example of this single-minded commitment, Solalinde accepted the 2015 “Voice of the Voiceless” award from Annunciation House, but did not attend the event at the pro-immigrant shelter April 18 in El Paso. Instead, he was busy marching from his shelter in Oaxaca to Mexico City with 300 Central American migrants to peacefully protest the government’s harsh anti-immigrant policies despite threats from federal police and immigration officers who managed to stop the march for a while. “Father Solalinde felt he could not leave his companions in the middle of this crisis,” according to a post on the Annunciation House website. “Father Alejandro Solalinde Guerra is essential” to the protection of migrants worldwide, said Camino Perez Bustillo, who introduced the priest at the NMSU migrant youth symposium. “He is a permanent inspiration,” said Perez Bustillo, becoming teary. “His presence is a testimony to courage and as to what courage really means. His struggle and his commitments have no borders,” he said. “As a result of his daily work… he has been recognized as the single most important force in positioning the issue of migrant rights in transit as one of the priority issues for human rights activists in Mexico,” he added. Over the years, Solalinde has received many awards including the 2011 Emilio Krieger Medal, awarded by the National Association of Democratic Lawyers, the Peace and Democracy Human Rights Award, the Pagés Llergo Prize for Democracy and Human Rights, as well as the “Lion Heart” from the University of Guadalajara Federation of University Students. Solalinde was also recognized with Mexico’s National Human Rights Award in 2012. Solalinde was born in Texcoco, Mexico State, to Berta Guerra Muñoz and Juan Manuel Solalinde Lozano. 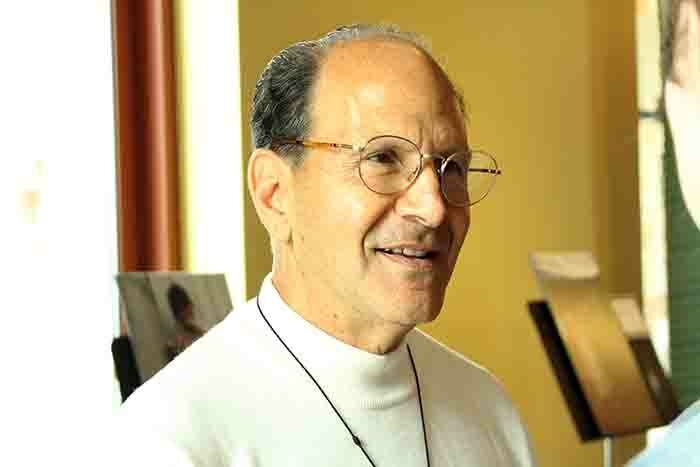 A Catholic priest for 40 years, he is the founding director of Hermanos en el Camino, which provides migrants with food, shelter, medical care, legal services and psychological services, and has dedicated the past ten years to helping immigrants. Four hundred migrants flooded the shelter near Oaxaca, the largest in Mexico for victims of violence, on its opening night in 2007. The flow has been constant since. Solalinde counts on the support of many women and young people worldwide, as well as national and international organizations, the Catholic University of Notre Dame, and many small private donors. Ever since the start of his seminarian education, Solalinde has been something of a rebel, with independent thoughts and beliefs that set him apart from his superiors and his peers during his seminary education, according to various news stories. As a young man, he joined the High School Institute of the Carmelite Fathers in Guadalajara, and he studied classical literature for two years until he was expelled from the Carmelites because his religious ideology around social activism differed from the order’s more traditional beliefs. Later he studied philosophy and theology at the Ecclesiastic Studies Institute of Higher Learning, but became dissatisfied with priestly education and left with 15 other seminarians three years before their ordination. This group of seminarians formed the Regional Council of Seminarians. Monsignor Arturo Vélez, bishop of Toluca, ultimately ordained Solalinde, who possesses bachelor’s degrees in history and psychology from the Autonomous University of Mexico State, and a master’s degree in Systemic Family Therapy. Solalinde, who travels with bodyguards and sought protection in Chicago for a while after fleeing death threats in Mexico, believes that politics, economics, migration and violence are interrelated. “I’m talking to you as a Catholic. As a believer my hope is that we can generate a sense of community all around the world,” Solalinde said to the NMSU crowd. He has repeatedly urged Mexican President Enrique Peña Nieto to take the path of democracy and has called on PRI politicians to accept responsibility and to undertake an act of contrition for the errors and abuses that have been committed during their 71-year reign in Mexico. “The president is the boss, and the government and ultimately the country follow in his footsteps,” Solalinde said. “My life and everything I have and own is to serve the human race, especially those that are more vulnerable, such as immigrants and the women in Mexico that are always vulnerable,” he said in an interview following his NMSU speech.